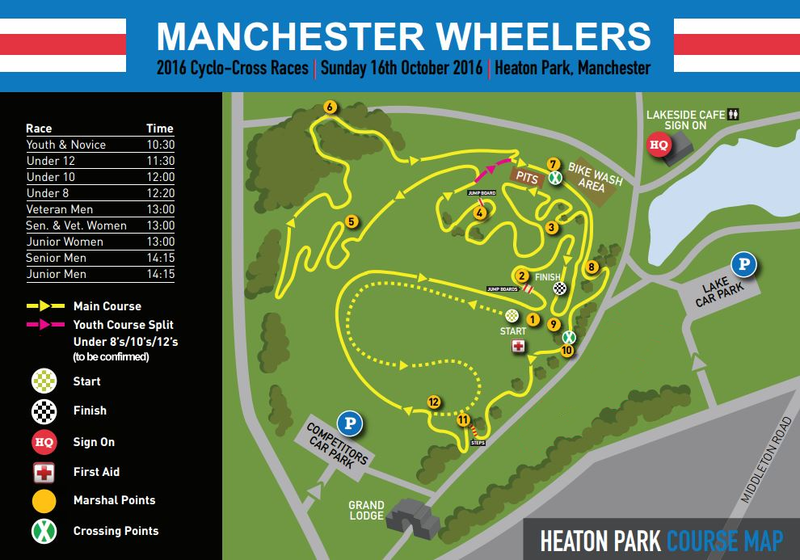 Next up in the North West League is a visit to Heaton Park, Manchester, site of last year’s North of England Championships in December and an earlier race in October run by MBC (Manchester Bike Club). See the map for race times, course, car parking areas and sign-on location. We’re using the same NofE’s course with the pits at the bottom of the hill, and a long, wide starting loop. In current weather conditions it will run as a fast course mainly over short grass with the rooty wooded paths included so watch out for pinch flats there. There will be plenty of tight turns on grass and around trees and three short hilly efforts per lap. Following feedback from the separate course lay-out (last year for these races at the North of England’s), we are going to move these courses to the main field in the hope to make the courses more interesting for each of the age groups. The courses will be slightly different for each age group, reflecting rider ability and age. Sorry for the confusion on the original course map. Sign-on is at the Pavilion Lakeside cafe, but please leave any muddy shoes outside, and please take care riding slowly through the park – it can get busy in good weather so please respect other park users. Sign-on closes 20m before each race start time. All entries on the day. Remember to take care of your bike in public areas, we don’t want any thefts. Do not ride on the course when another race is in progress and please respect fellow competitors, organisers, commissaires, judges and marshals at all times – massive thanks to all the volunteers, we couldn’t do this without you! Remember the code of conduct. There will be toilets at the start/finish area, Natasha will be there too with her coffee van and Madison are coming along for the day. Competitors car parking at Bury Old Road entrance, M25 1JH, for a £2 fee or at the Lake car park on Sheepfoot Lane, M25 0DL, also a small fee. Please do not drive down through the park to the pit area, we got some complaints last year and don’t want to jeopardise use of the Park.